There’s no denying that the event-planning business is a booming industry. As much as people like to be involved in the planning process, it can be quite stressful to do on your own. There’s just a lot of things that need to be taken care of. From budget planning to venue reservations, planning an event is no easy task for anyone. Because of this, most people opt to hire professionals to do the job. Event planning consists of a team of individuals responsible for bringing a vision to life. The role of an event planner goes beyond mere decision-making, it also requires extensive research and simple analysis for every aspect of an event. This is why event planning companies get good money for what they do. 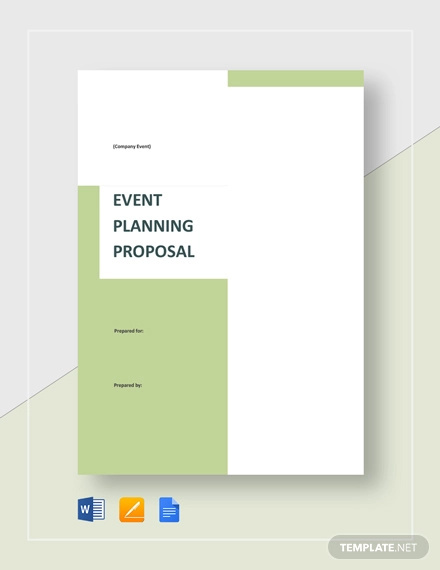 What to Include in an Event Planning Service Proposal? Clients don’t always know what they want, they can only provide you with bits and pieces of what they like. You can use this to your advantage by developing a proposal based on unique concepts proposal or popular trends while still incorporating your client’s needs to it. Entice your clients with an outline of your offered services that is sure to keep them interested. Finally, don’t forget to include an estimated budget proposal. Most clients would like to know the price of your services before they even begin to consider anything. Creating a well-made proposal will not only please your clients, but it may also develop a sense of trust. How to Start an Event Planning Service? Determine your target market. It could cater to a corporate market or a social market. They may even vary in size, they could go from simple birthday celebrations to annual music festivals. Identify the startup costs. Any type of business is a pricey investment. Costs may include office rent, staffing, and other essential resources. Business operations. This type of business must be flexible with its operations. Peak seasons, such as the month of December, may be the busiest months for the business. You must be able to work overtime in order to meet your client’s demands. Pricing. Determine the costs of your services based on labor and material costs. Marketing. Develop a marketing plan to make your business visible. Any form of advertisement will give your business the boost it needs. Specify your goals. This would include the vision that your company has for the event. You need to be specific with your objectives otherwise, sponsors may find a reason to decline it. Look for possible sponsors. Potential sponsors proposal are usually those who may have a good reason to support your event. For instance, triathlons may be sponsored by sportswear companies. Negotiate with what you can offer. A company sponsorship typical has a catch to it. This is usually done through company advertising and announcements. Be professional. The way you structure your proposal template must possess a level of formality. To do so, be sure to proofread your proposal and make follow-ups when necessary.